The Next Big Japanese Thing? Cat Tails Powered by Your Brain. In Japan, catgirls have been popular for a long, long time. They've inspired endless video game, anime, and manga characters as well hairstyles and even a set of cat ears ("neko mimi" in Japanese) called "Necomini" that can read your brain waves. The folks behind that product, a Japanese company called Neurowear, are at it again. This time, they've got something, which will hopefully wag your tail. Literally. It's called "Shippo", which means, "tail" in Japanese. This mechanical tail reads your brain waves and wags according to your mood. According to Neurowear, your mood is read by an app, which also tags your location and shared via Facebook or Twitter. This enables you and your friends to search for places those fellow Shippo wearers have found relaxing. To use Shippo, wearers must also use the brain wave reader, along with a heart rate monitor that can be clipped to the user's ear lobe. Around the turn of the century, a tail fad hit Japan for a brief moment, and fox tails were popular. Japanese popstar Ayumi Hamasaki often wore faux fox tails, clipped on the side of her jeans, in music videos, concerts, and photo shoots. Madonna did the same thing for a while, too, and I'm not sure who started doing it first. Even now, there are still fake fox tails sold in Japan as fashion accessories or to be clipped on things like the iPad. 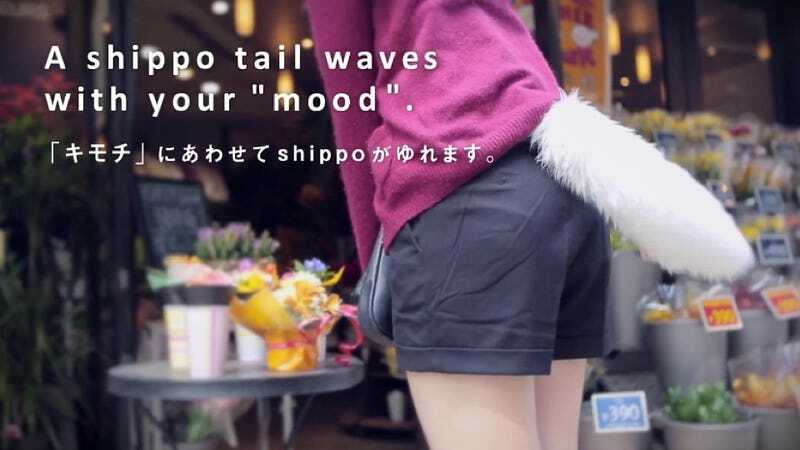 However, I believe this is Japan's first mechanical cat tail that reads your brain waves! Shippo was unveiled at this year's Tokyo Game Show in its prototype form. No word on its release date or pricing.